OpenXR is an open royalty-free standard from Khronos that provides native access to a wide range of devices from many vendors that span across the mixed reality spectrum. With OpenXR, you can build applications that target both holographic devices (like HoloLens 2) that place digital content in the real world as if it were really there, as well as immersive devices (like Windows Mixed Reality headsets for desktop PCs) that hide the physical world and replace it with a digital experience. OpenXR lets you write code once that's then portable across a wide range of hardware platforms. The OpenXR standard is currently in a provisional phase, with an initial OpenXR 0.90 spec released for feedback. For more information on OpenXR, including access to the provisional 0.90 spec and headers, see the Khronos OpenXR page. You can try out the provisional OpenXR 0.90 API today using the Mixed Reality OpenXR Developer Preview. This early runtime enables applications targeting the OpenXR 0.90 API to target Windows Mixed Reality immersive headsets on the desktop. If you don't have access to a headset, you can use the Windows Mixed Reality Simulator instead. Be sure you are running at least the Windows 10 October 2018 Update. If you're on an earlier version of Windows 10, you can upgrade to the October 2018 Update using the Windows 10 Update Assistant. If you're feeling adventurous, you can install a Windows 10 Insider Preview build. Set up a Windows Mixed Reality headset or follow the instructions to enable the Windows Mixed Reality simulator. Install the Mixed Reality OpenXR Developer Preview app. This app gets you set up with the preview OpenXR runtime on Windows 10 October 2018 Update or later. After installing this app, the Windows Store will keep the runtime up to date. Run the Mixed Reality OpenXR Developer Preview app from the Start menu and follow the instructions to make the runtime active. Soon, this app will let you explore other OpenXR debug information as well. Follow the steps above to install the Mixed Reality OpenXR Developer Preview. To set the Mixed Reality OpenXR Developer Preview as your system's active OpenXR runtime, install the Mixed Reality OpenXR Developer Preview Compatibility Pack. The hello_xr OpenXR test app demonstrates use of various parts of the API. You can follow these build instructions, which will build both the test app and the OpenXR headers themselves. To give feedback on the OpenXR Provisional 0.90 specification, please visit the Khronos OpenXR Forums, Slack #openxr channel and the spec issue tracker. Here are some troubleshooting tips for the Mixed Reality OpenXR Developer Preview. If you're hitting any other problems, please visit the Khronos OpenXR Forums or Slack #openxr channel. If your OpenXR app is not starting Windows Mixed Reality when you run it, the Mixed Reality OpenXR Developer Preview may not be set as the active runtime. 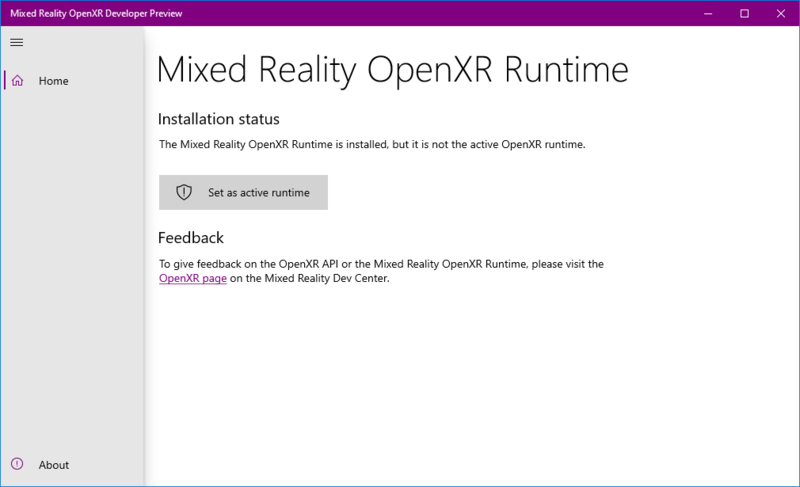 Be sure to run the Mixed Reality OpenXR Developer Preview app and follow the instructions to make the runtime active. Be sure you are running at least the Windows 10 October 2018 Update. If you're on an earlier version of Windows 10, you can upgrade to the October 2018 Update using the Windows 10 Update Assistant. If the Install button on the Mixed Reality OpenXR Developer Preview app does nothing on Windows 10 October 2018 Update, your system may have cached stale system requirements for the app. You can run the command wsreset.exe from a command prompt to clear the cache.